This is such a cute book. 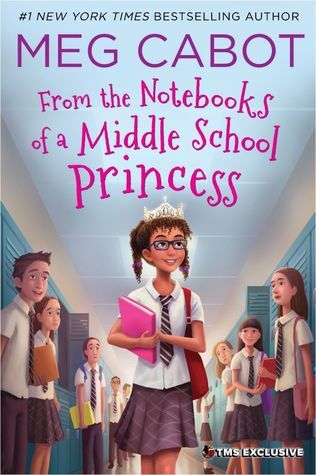 This middle grade read is a great way to introduce the world of the Princess Diaries to a new generation. It feels fresh and fun. I loved the Princess Diaries books. I read about half the series and then got sick of it. As much as I liked Mia and her awkwardness, said awkwardness did become annoying after awhile. I actually like Olivia more than Mia. She is more self-possessed and confident than her older half-sister. Perhaps that's because she's younger and hasn't yet hit the awkward teen years yet, but I think she will handle those with aplomb. A difference I see between Olivia and Mia is that Olivia has had a difficult life - with her mother dying and her aunt & uncle treating her like a second class child - yet Olivia just goes along with things. Mia had an easy and happy childhood, but thought her problems were 1000 times worse than they actually were. This is a simple book and a familiar story to anyone familiar with The Princess Diaries. But I loved it all the same. I'm happy to stay in the world with a less annoying character than Mia (although I love her too). Recommendation: A must read for any Princess Diaries fan. I loved the Princess Diaries series growing up, and I recently read Royal Wedding which really made me nostalgic! I've been meaning to pick up this new series, I did love Olivia Grace, from what we got to see of her in Royal Wedding, so I'm sure her story will be great. Thanks for the review! I am going to put this book on my list too.